The Yellowstone Gallery and Frameworks, established in 1984, is in a special location, literally at the doorstep of the world's most famous park. This lovely location is an invitation to the sights and sounds of Yellowstone, and Montana's natural beauty and rich history. This eclectic gallery is dedicated to a variety of artistic interpretations, both past and present, of the landscape, wildlife, and cultural heritages of the west. It is also dedicated to the preservation of Yellowstone Park. The gallery is open all year and features both permanent and changing exhibits in various media, including: oils, water colors, bronze sculpture, limited edition prints, posters, and fine photography. 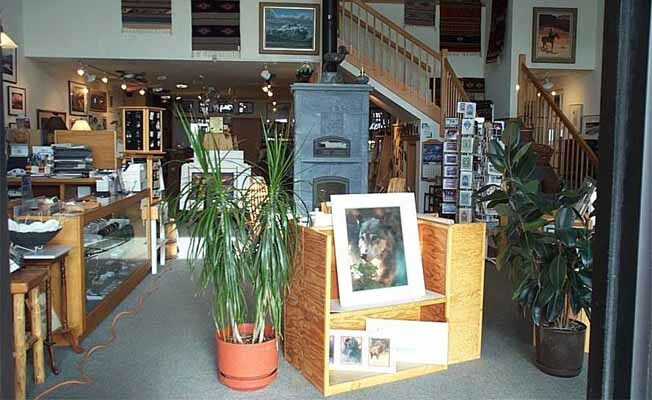 Other offerings include: Made-in-Montana pottery, willow and pine needle baskets, books, cards, jewelry, Montana Yogo Sapphires, CDs, and custom framing. Call 406-848-7306 for more information.